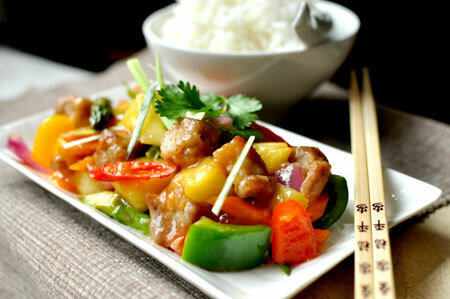 Without fail, sweet and sour pork would be ordered when my friends and I eat out at a Chinese restaurant. Its something about it that is completely addictive and satisfying. Often enough though, it is a goo of florescent orange and you can’t really see which is pork and which is veg. When you do find a piece of pork, you are then wondering if you are eating pork or pork substitute or just plain old batter. Still, we order it! For Seewoo, I have decided to recreate this favourite in the kitchen, with fresh vegetables and pork belly and pork ribs. (You can use chicken instead). I am not sure how it is done in a typical Chinese kitchen but this is how I did it. Cut the pork into bite sized pieces and poach in salted water for 10-15 mins or until cooked. Drain. Set aside. Once the meat has cooled down, coat the meat in the tempura batter and shallow fry until golden brown. Chop all the vegetables into bite sized chunks and fry in a hot wok or frying pan with garlic, adding oyster sauce, light soy sauce and season with some extra salt, sugar and pork seasoning. If you don’t eat pork, you can use vegetable seasoning or chicken seasoning. You do not want the vegetables to be over cooked, they should be crunchy. Once you have finished seasoning, add the pork to the stir fry, some seasame oil and pour in the sauce mixture. 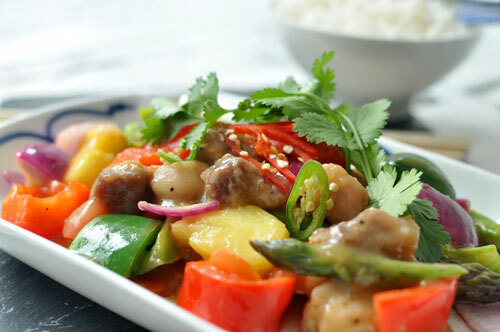 Continue to stir fry evenly, taste the food and add more soy if it needs more salt, more sweet if its too salty and more sour if too sweet – use juice of lemon. If the sauce is too thick, add more water, if it is not thick enough, add more tapioca starch. Garnish with spring onions and/ or coriander. Serve with steamed rice. Incidently, a lot of people on Twitter said they use ketchup with this recipe, I tried it, but preferred the subtle taste of this dish and enjoying the taste of each and every vegetable when I bit into it without the same ketchup taste all over, hence, why I decided to put fresh tomatoes in this recipe instead.